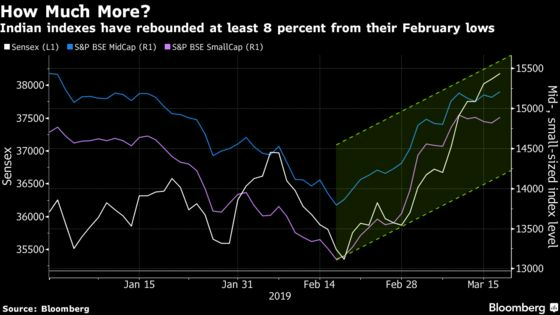 (Bloomberg) -- The recent advance in Indian stocks brings a dilemma that investors face with every rally: is there more to it? A local brokerage thinks not. Indian equities have rebounded by at least 8 percent from the year-to-date low they touched last month, mainly due to a surge in inflows by overseas investors. A bet that Indian Prime Minister Narendra Modi will regain power in national elections through next month is seen as an additional boost for local stocks, while a less hawkish view by central banks around the world is propelling foreign funds to riskier EM assets. Not all, however, share Kotak’s view on how things will unfold. Goldman Sachs Group Inc. in a note earlier today said Indian equities have more room to gain in the run-up to elections, upgrading its stance to overweight. At least five opinion polls conducted in March indicate that Modi’s Bharatiya Janata Party and its allies will come close to a majority when votes will be counted on May 23. Investors have been purchasing shares in mid- and small-sized companies after they lagged behind larger rivals in 2018 and have been betting on a revival of financial companies’ earnings, according to Kotak. Still, Kotak says value can be found in shares of non-state and state-owned lenders, non-bank finance companies and other state-controlled firms.